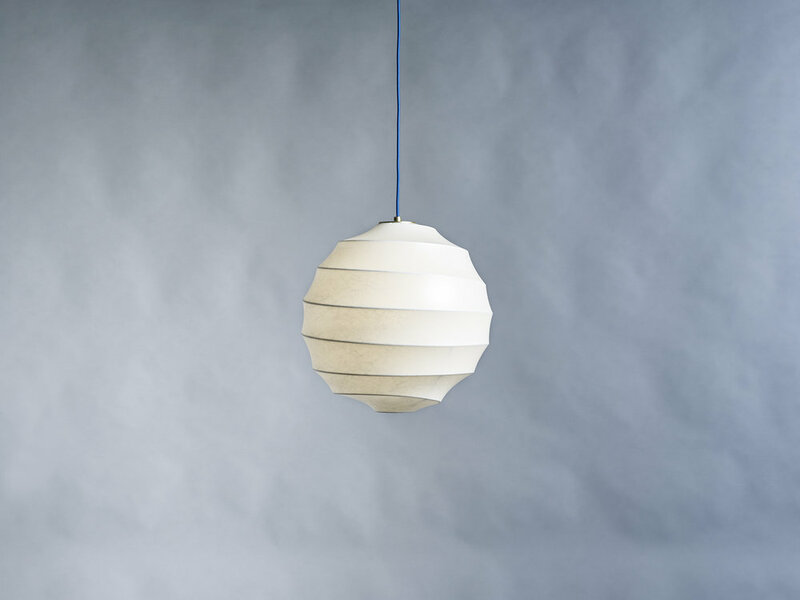 Snowball designed in the year 2009 by Carsten Jörgensen is referencing the long tradition of paper lanterns we know from China and Japan. The design is although not an iconoclastic approach but rather an attempt to give something valued a twist. Paper lanterns are in reality extremely demanding craft objects when paper is bent over a framework of thin bamboo sticks. To get a flat sheet of paper to bend along the bamboo constructions curves demand deep knowledge and extraordinary skills since paper can’t be forced into a 3 dimensional double curved plan. The cocooning material used for our lamps has entire different material properties since it has the ability to shrink over frames of sturdy wires resulting in so called double curved planes hardly achievable in any other material. These planes seem to be of an organic character and of a highly aesthetic beauty. Since design oscillates between sheer functionality and the brain's ability, in a hallucinating way, to combine what we see and what we think we see, blended with an infinite number of sensitive experiences. Then it is no wonder that seeing the imprint of one's fingers in a snowball has a similarity with the concave helix plane winding around the bulb in an object named Snowball pretending to be a lamp. Light is although filtered, bended, reflected and refracted along these curves and appears glowing complementary to the perception of a snowball. That is the point, hard to comprehend, but contradictions often foster huge energies out of which light in splendid granulated crystals can be imagined to spread in waves like rings of waves when a stone is thrown into a pond. Due to the dim-ability of the light source it is easy to adjust the intensity of the light coming from the Snowball and you can nearly throw the snowball in any place of your home. The lighting source can be dimmed. It is a A++ LED bulb with a milky finish providing 800 lumen at 10-watt, the same as a 75-watt incandescent light. The colour of emitting light measured at the bulb is 3500 Kelvin, meaning in the middle of the visible color spectrum toward blue. The actual provided light measured at the screen is 3000 Kelvin. 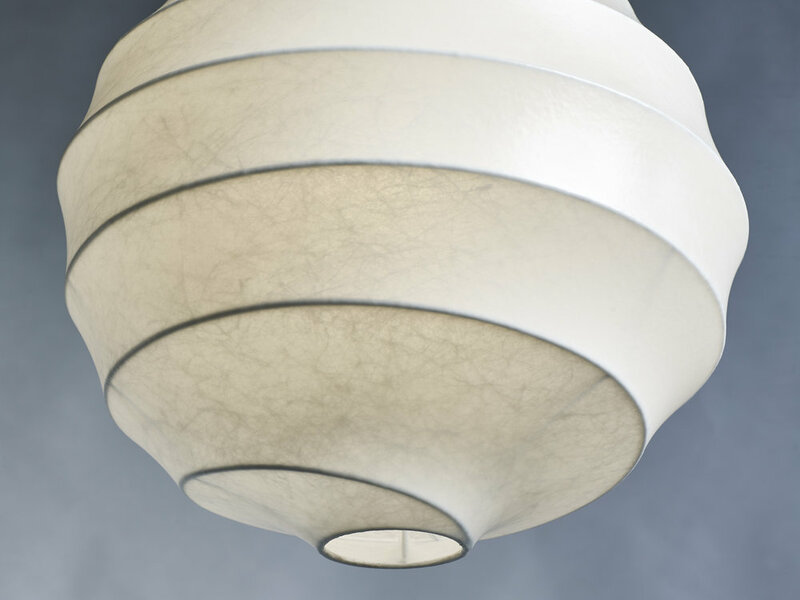 This allows Snowball look a bit cooler than other cocooned lamps from madetostay. The colour rendering ability (Ra / CRI) is rated to Ra 90. An incandescent light will in comparison provide Ra 100, meaning that the colour rendering ability by LEDs is less. However, in comparison to other electrical light sources is the most energy saving lighting source known. This is the reason we have chosen LED as a lighting source for nearly all madetostay lamps. With a guaranteed life cycle of the madetostay LED bulbs of 25000 hours it becomes a reason more to choose LED. Therefore we have decided to offer the same length of guarantee for the Snowball. 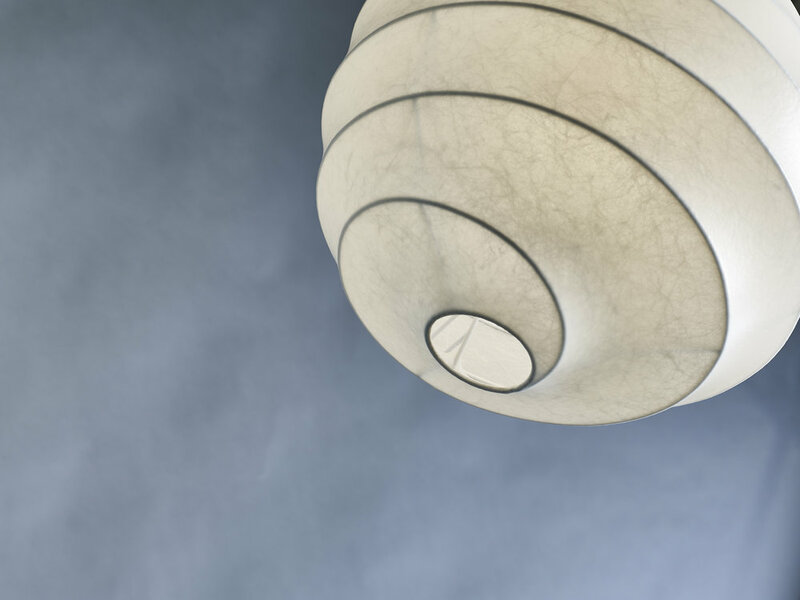 The Snowball is shaped over the internal white powder coated steel helix, which is supporting the cocooning polymer (plastic) fibre. The cocooning screen is provided with two additional protecting translucent matt lacquer finishes, which makes it possible to clean the surface of dust and other emissions from the air. The cocooning is soft and resists short and light pressure from non sharp objects. If deformed it will after a short time regenerate to its original shape. The cocooning should although not be set under continuous pressure from any objects. Lantern is delivered with 4 meters of power cord with your choice of 4 colours; black, white, red and orange. To cover power outlet in the ceiling we have included a simple to install white metal cover, which makes it easy to install the 43 cm big snowball, and you can even add another three snowballs if you have such a demand.